Pro-Cal 100 Shakes alleviate flavor fatigue with four delicious flavors, chocolate, vanilla, strawberry and cappuccino. The Pro-Cal 100 Shakes provide every essential vitamin and mineral, plus 150% of the US RDV of Protein. Each serving contains 100 calories and 15 grams of protein. 1 box of Pro-Cal 100 Shakes contains 12 single serving packets which can be mixed with an 8 oz. glass of cold water. 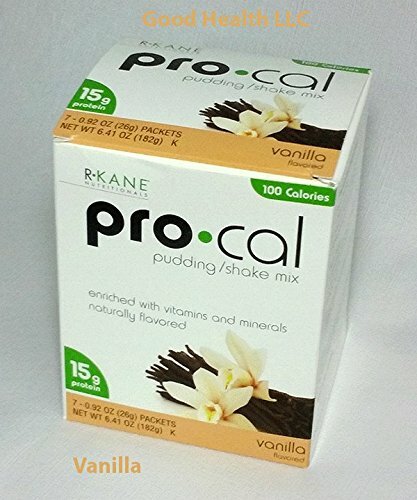 Simply add water and stir.Pro-Cal 100 Shakes are most commonly used in physician monitored weight loss protocols and can be purchased here, along with the complete Pro-Cal line of products manufactured by R-Kane. If you have any questions about this product by R-Kane, contact us by completing and submitting the form below. If you are looking for a specif part number, please include it with your message.